Slept in a bunk room at the Lago Grey Refugio and in the morning snagged coffee from the dining hall while the sound system played Bob Marley—odd breakfast music, but all part of the experience. The park is truly magnificent, but the tourist experience is overwhelming. Last evening, while sitting outside watching the setting sun reflect off the mountainside, I had to put on headphones to drown the chatter from the sitting area inside. Never quite understood the need to fill up all the air and time with words. 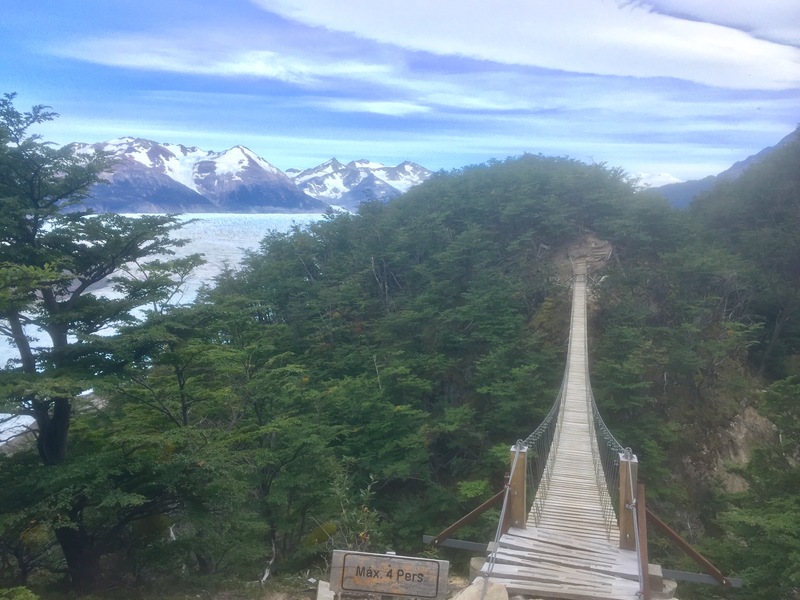 Imagine my exhilaration this morning when I walked the trail up the lake (away from Grande Paine) for about four kilometers, crossing two long swinging bridges to sit on a rock high above the glacier. The path went up through old beech and was absolutely quiet—no sign of any hikers until my way back. It was sacred. The only sound on my rock was the occasional crack of the ice and the faint tap-tapping of some type of woodpecker. The wind blows so hard here, it’s rare to hear a bird call, but I had noticed nesting holes in the older beeches and so had been puzzling about tappers. Never saw it, but she kept me company this morning. The hike back to the lake and my campsite tonight went fast, though by midday there were hordes heading up the trail. Found a good place to pitch my tent and discovered stuck on the back a campsite sticker from trekking in Iceland—a well-travelled tent. 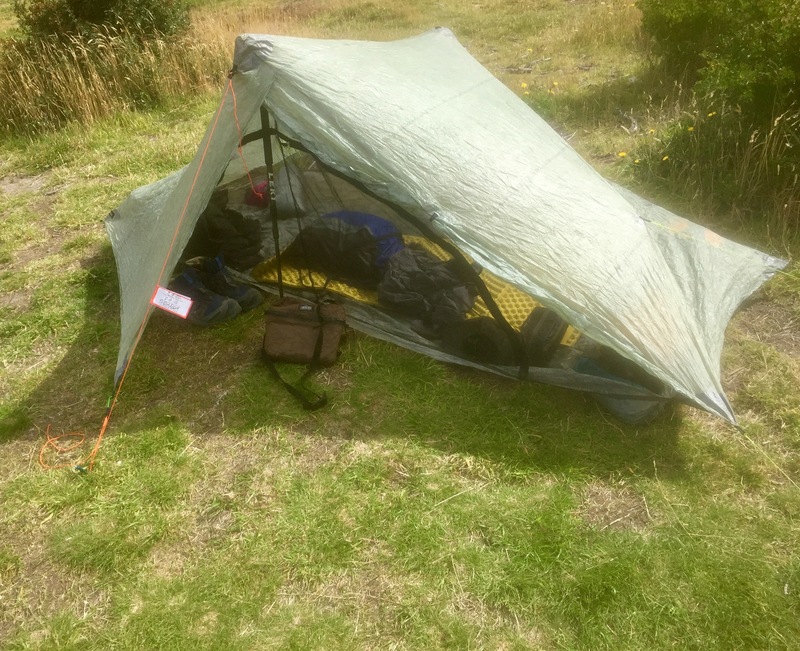 Tomorrow I repeat the transport cycle back to Puerto Natales, but tonight I get to sleep outside. One of those days that makes me wonder about transportation infrastructure for scenic hiking. Torres del Paine is probably the largest tourist draw in southern Chile. A park with mountains, lakes, glaciers, and well-designed paths, it serves to draw huge numbers of walkers, each with varying experience. 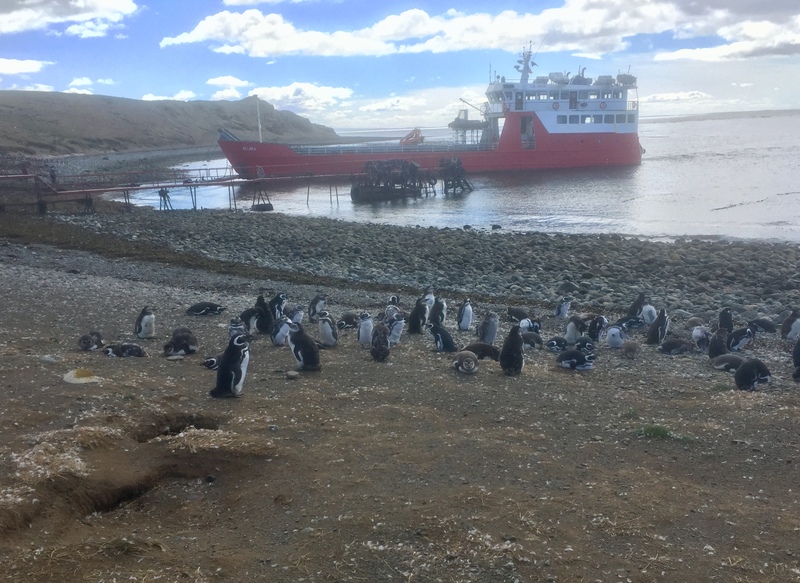 The systems in place—buses, ferry boats, refugios, campsites, equipment rental companies, hostels, and travel agents—all conspire to both attract visitors and fulfill their needs. The stress on the ecosystem is palpable, though the number of people has been restricted in the past few years, owing to a fire that destroyed much of the hardwood forests growing in the park. 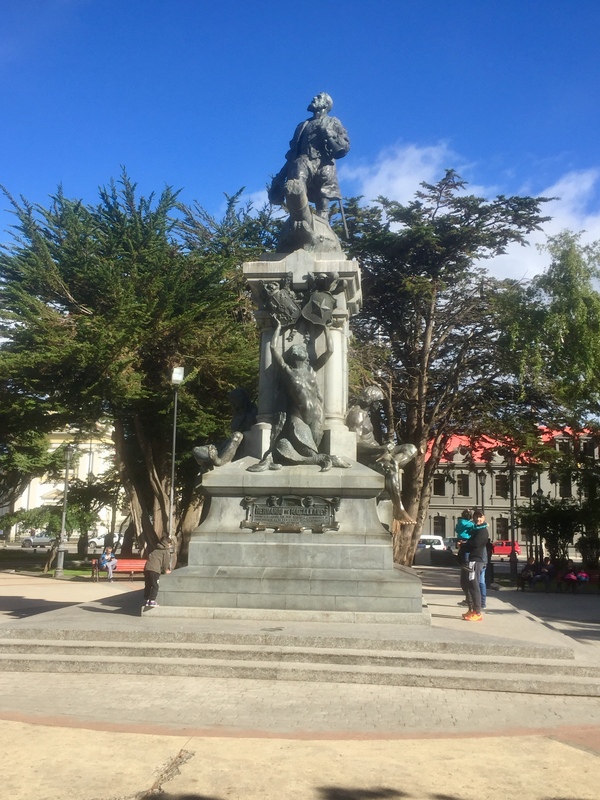 It was started by some foreign campers causing something of an international incident, apparently with the offending country paying reparations to Chile. Now I understand why when I bought matches at the supermarket, the cashier asked if I was going to Torres del Paine and frowned when I said yes. There is much resentment for the destruction, which I saw firsthand today as all the trees were dead, dried bones with scorch-marked still-standing trunks. My transportation started with a very early walk to the bus, three hour ride (the last on gravel roads) across huge tracts of grazing land, both sheep and cattle. After entering the park (which seemed like crossing an international boundary) the bus wound past tall, jagged mountains with a lot of snow-pack at altitude. The rock strata are clearly evident with the upthrust pitching the lines at all angles. The bus dropped the crew at Lake Pudeto to await a water taxi to take us to Paine Grande— a deluxe refugio (that also has a campground) which serves as one of the entrances to the trails. 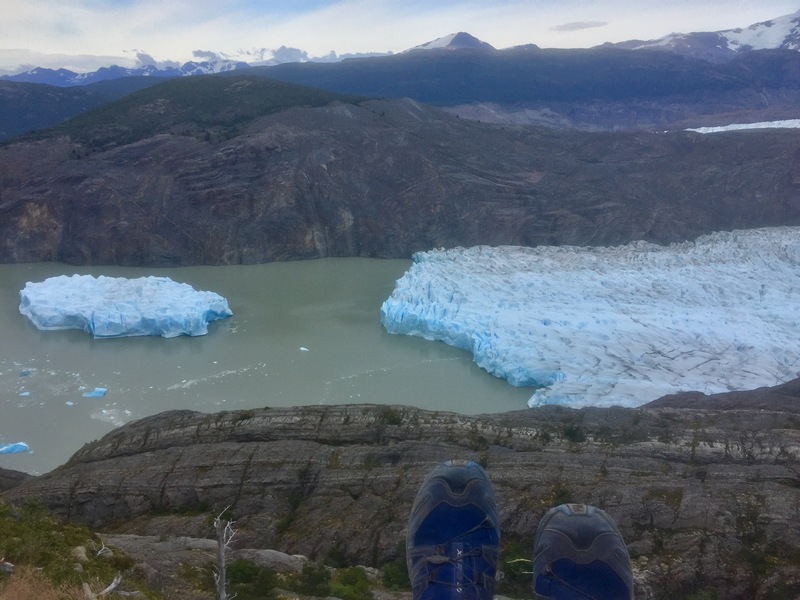 As I could not get enough sites reserved to make a substantial trek, my days are determined by the reservations I could make, so today I walked to Refugio Grey along the lake to the glacier, and settled in there. Tomorrow I explore a bit then back to Paine Grande to camp and catch the ferry the following morning. Not exactly a rigorous trek but been really having knee problems so it’s just as well. 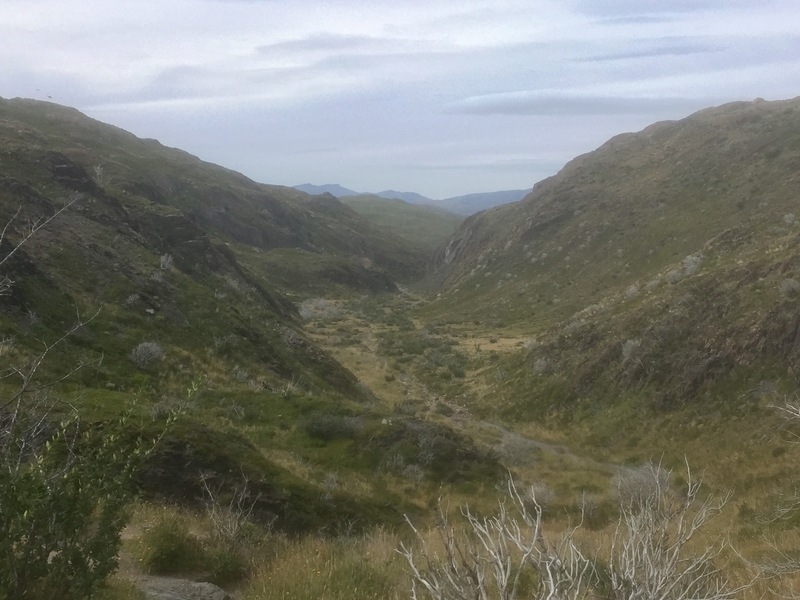 The beginning of today’s walk brought double deja vu—the very beginning was exactly like the start of the Laugavegur Trail in Iceland, but once the path started up a narrow valley and the sun appeared, it was exactly like the opening climb up Kinder Scout on the Pennine Way. It was a rocky path, though the ascents and descents were gentle. The campsite at Grey is in an unburned woods, including an old growth section of beeches that closely resemble the ones in New Zealand, which helped give some sense of what the park used to look like. It was also one of those walks with a climax at the end. At the head of the lake is a large glacier, and the path stops at a viewpoint just above a quiet cove filled with huge pieces of blue and white ice broken off and just drifting. Curious why the ice is so blue, but as I write this the Internet is no where to be found. Besides, I just want to think about it for a while. As I sat there watching the sun sink, the air would echo with sharp cracks which I first took for avalanches up the mountainside, but then realized (of course) it was the ice breaking off into the lake. Evening music. Time is heaped up helter-skelter in Patagonia. 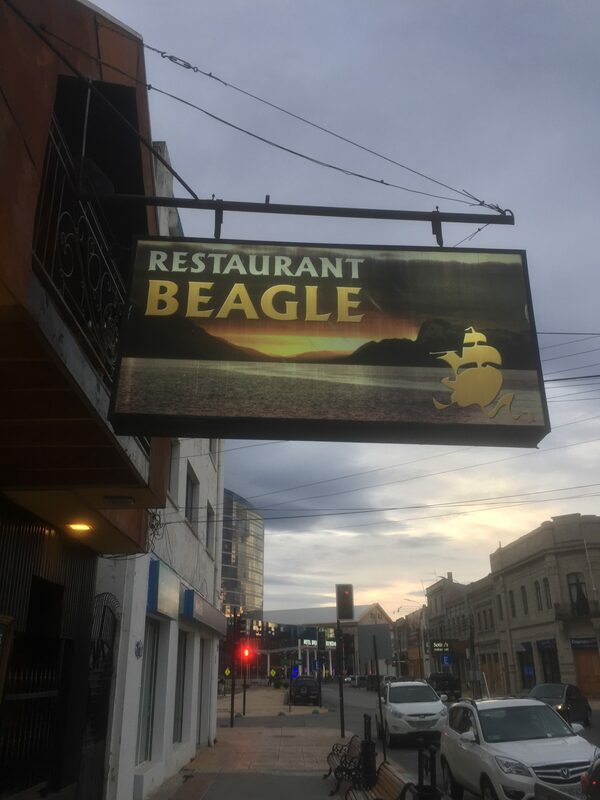 As the Beagle circled the land and Darwin took numerous excursions into the interior, the great naturalist puzzled over the geology he encountered. I always associated his thought with biology—mammals, birds, earthworms—but most of the Voyage is about rocks, specifically speculation about the strata of fossil shells high up on table land— uplift, erosion. There is much more Lyell than Malthus in The Voyage of the Beagle. 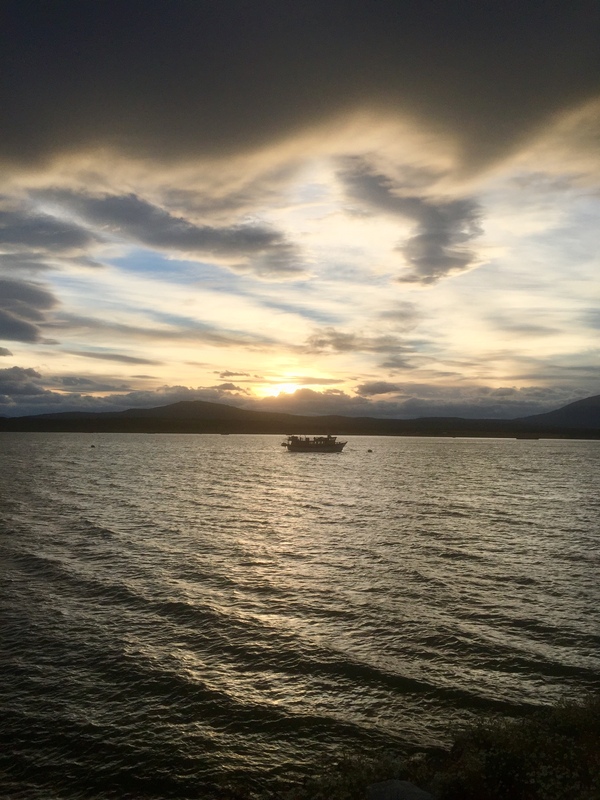 In Patagonia, time is right on the surface. Water, wind and geological upheaval expose dinosaur bones, mixing them (at least in the imagination) with more recent but still long extinct species: toxodon, mylodon, megatherium, astrapotherium and the macrauchenia. And those are mingled with modern monsters—bones from the great whales hunted in these waters. Bones, fossil or just old, small but often large, adorn the lobbies of hostels, crowd restaurant coffee tables, turn up in unexpected places. Here dinosaur bones dine with whales and with humans. 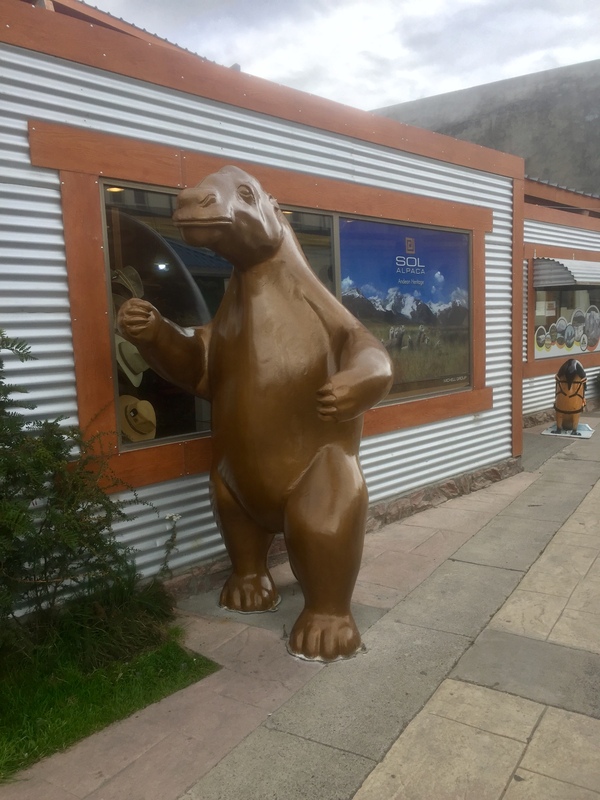 Bruce Chatwin starts In Patagonia with a similar jumble, as his grandmother identifies the piece of mylodon skin (mylodons are extinct ground sloths whose imaginative profile decorates every street sign in Puerto Natales) with that of a brontosaurus. Both are ancient by human standards, but in geological time, the mylodon is fresh as a daisy. What is fascinating in that opening chapter is Chatwin’s leap from historical extinctions to possible human extinction through nuclear war. He notes that his interest in Patagonia was rekindled in school when Cold War planners explained blast zones and possible safe regions. Maps had to be redrawn and the strategy re-articulated with each new development of increasingly devastating bombs, so Chatwin looks to his atlas and discovers the end of the earth, the place out of the circles of destruction. Nuclear war hovers over his book, sometimes explicitly as when he speaks with an elderly Argentinian who may have known Butch Cassidy: “The old man had come out and was standing behind me. ‘No one would want to drop an atom bomb on Patagonia,’ he said.” But also implicitly as the book is haunted by fossils and by isolated survivors, people dispossessed of their own history, keeping it alive with simple details—songs, clocks, paintings—in their own distant versions of a bomb shelter. In Patagonia is a chronicle of those isolatos and in some ways is a meditation on the end of the earth taking place at the end of the earth. Chatwin recounts childhood bullying when he spoke of his family’s (mistaken) ownership of brontosaurus skin, then turns to his schoolboy fear inspired by the bomb. This puts in sharp relief the impact of schoolyard terror, something particularly poignant in the USA today given the impact of the most recent school shooting and the political firestorm it has ignited. Most heartbreaking in the news was a student describing his as the “school shooting generation.” Theirs is, in so many ways, much more palpable than that of the “bomb shelter generation,” but the latter is the context through which to read Chatwin and perhaps understand some wanderers who have Baudelaire’s malady, the horror of one’s own home. Chatwin’s childhood atlas search for a blast-free space brought home sharply the nuclear-meteorological stories of my youth. Of course each region has its own narrative, but in Shenandoah County, Virginia, it went something like this: even though Washington DC was only 100 miles away, the prevailing winds —usually coming strongly from the west—and the mountain range would shelter the area from any fallout. To the west was West Virginia and no one would waste a warhead on it. Those of us in Woodstock would survive the initial blast; it was the aftermath that was ambiguous. Of course each house had a basement supplied with canned goods—Chef Boy-R-D sold a generation’s worth of raviolios in those years. As children, even though we had to practice hiding under desks, we were more or less sheltered from the bomb shelter mania as the threat remained nebulous (unlike today’s gunfire threats). It was only occasionally we were reminded of possible extinction, living instead in a world where it seemed (at least as children) that nothing could touch us. The sight of a rifle prompted questions about the hunt, not schoolhouse drills. Apparently the US government subscribed to roughly the same narrative as they built a number of secret facilities west of Washington DC designed to house those who might be left were armageddon to occur. One that remains famous is the Greenbriar, a luxury retreat that still has a direct train line to DC. Another that is less clear is a mountain somewhere near Strasburg Virginia which is supposedly hollowed out and ready to receive the Congress. To bring this closer to my story, there are parts of my father’s life that remain ambiguous to me. Coincidentally, he was born in Greenbriar County near what would be that Cold War facility. He went to Virginia Military Institute during WWII—class of 45, though they accelerated the program in those years—so he transitioned immediately to medical school at the University of Virginia. On graduation did his residency at Johns Hopkins (he loved to relate a story about steaming a bushel of oysters in the autoclave one night on emergency room duty). He was commissioned in the Public Health Service and was on a career that would have taken him to Washington and the offices of the Surgeon General (I well remember the uniform in the attic cedar closet). Instead, he overshot and took up a rural surgery practice in small-town Shenandoah County. I heard a number of explanations for this move, including the idea that the valley would survive a first-wave atomic attack, but what is burned in my memory is a small, old-fashioned suitcase that remained in the hall closet in our house on Summit Avenue in Woodstock. Of course we asked about it. Children explore every inch of the house where they grow up, and I knew it as well as Chatwin did his mylodon skin. I finally got an explanation which I first heard with amazement, then later with a teenager’s skepticism. Supposedly my father was the official surgeon for the underground facility near Strasburg about 15 miles away (it was probably the Mt. Weather facility in Bluemont). Of course this was a story I could not tell, and as the Cold War slowly thawed, it faded from my memory, becoming a tale I gave little credence until in my own middle-age, raising my children in the shelter of the shadow of that same mountain range. he died and I sorted out his papers including the documentation of his appointment (just now, here at the end of the earth, I try to remember the exact papers, and all I can say is that they confirmed the childhood legend). Chatwin provides a new perspective on wanderlust. Professionally he found himself in the middle of writing a scholarly book on nomads that he knew no one would ever want to read, and while on an assignment to write something also inconsequential, he fled to Patagonia to seek stories that would help him make sense of his own. Fleeing is of course a survival instinct, but fleeing-from always brings a fleeing-to, and the world is every bit as immanent where you find yourself as it was where you were. The bomb-shelter generation’s watchword was “alienation,” a sense of displacement usually ascribed to stifling middle class values, the American business ethic, and a certain nomadism built into an emerging western culture. But, as we are learning from both the proliferation of weapons of cruelty along with global environmental degradation, alienation also grows from the shadow of impending extinction. My father’s position at a facility at the moment of Cold War apocalypse was a form of patriotic duty framed by historical circumstances, but what is left out of the story is that he was to report for duty alone, trusting the safety of his family to neighbors in an uncertain environment. Coming close on the heels of the great sacrifices of WWII where patriotism was articulated differently than today, his is a decision I cannot even begin to judge. Rather, like Chatwin teaches in his own indirect way, we all have to struggle to understand and reconcile solitude, obligation, and love with the end of the world. For the category of odd but helpful coincidences: in part to help wrap my head around the vastness of Patagonia and to further an understanding of solitude (which I seem to write about incessantly), I was reading Gretel Ehrlich’s The Solace of Open Spaces, which describes her time on Wyoming sheep farms. In one essay she describes the shepherds who stay long months away from any human contact, living in sheep wagons. Over morning coffee, I tried to picture such a wagon, then, on crossing the street, I passed a place selling traditional Patagonian products, particularly wool, and they had a Chilean version of a shepherd’s wagon parked out front. It was as I had imagined, though I’ve not yet been able to imagine that sort of solitude. It was a Saturday, with some early signs of festivities—I passed a group of musicians in traditional clothes—but the town in places was a lonely as a shepherd’s wagon. In a desultory stroll, I performed the necessary tasks—equipment for the trek, finalizing transportation, buying food. There is a large UniMarc supermarket which is apparently where everyone was. For some reason I couldn’t face that, so I ambled on to a smaller local shop that didn’t really have all that I needed, but moved at the right pace. Again today I was reminded of my small-town childhood. Even though this is a tourist town and one would assume weekends are busy times, many of the businesses, including restaurants, were not open or they closed at noon. I remember in Woodstock, many if not all the businesses closed at noon on Saturday, remained closed (by blue laws) on Sunday and usually closed on Wednesday afternoons. 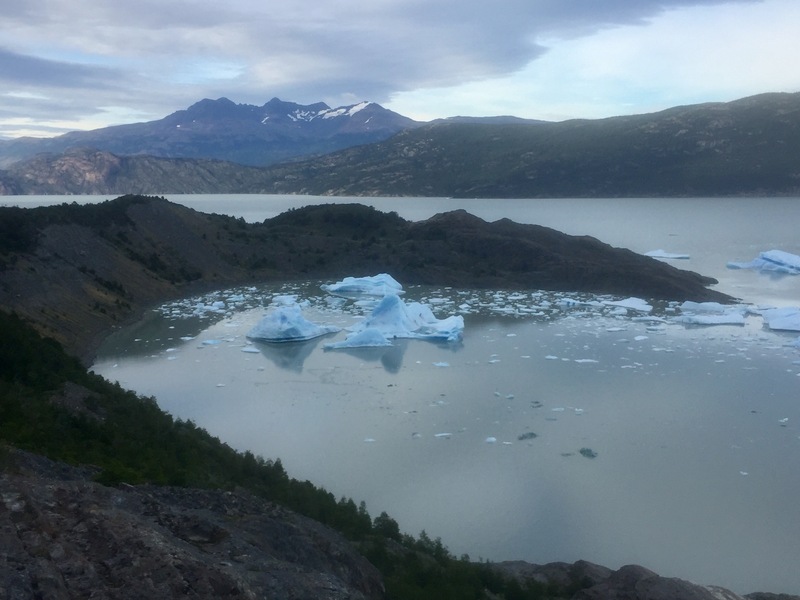 Given the possibility today to order anything on Amazon at 3:00 am, such a pace of commerce seems as slow as the Moreno Glacier. It was a time when we didn’t define ourselves by what or how we consumed. Some of that perhaps still lives here. One place that was open was Mesita Grande, a pizza restaurant just off the train engine square. It was a large table, lined with generally happy people, watching the servers smile, laugh, and occasionally dance across the space. 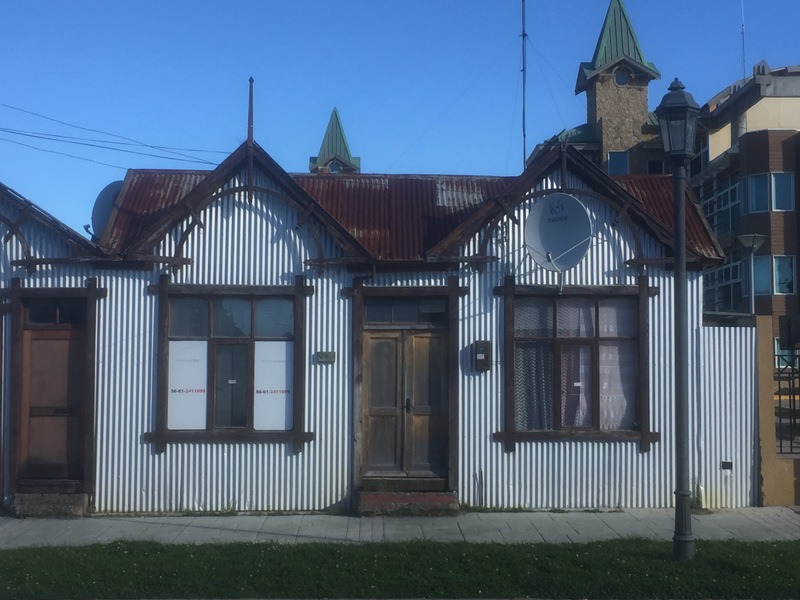 Although not a Patagonian version of a Cracker Barrel, it had probably once been dry goods store and a lot of the furnishings remained, including old enameled metal signs for Lustre Nubian and Señorita Brasso. 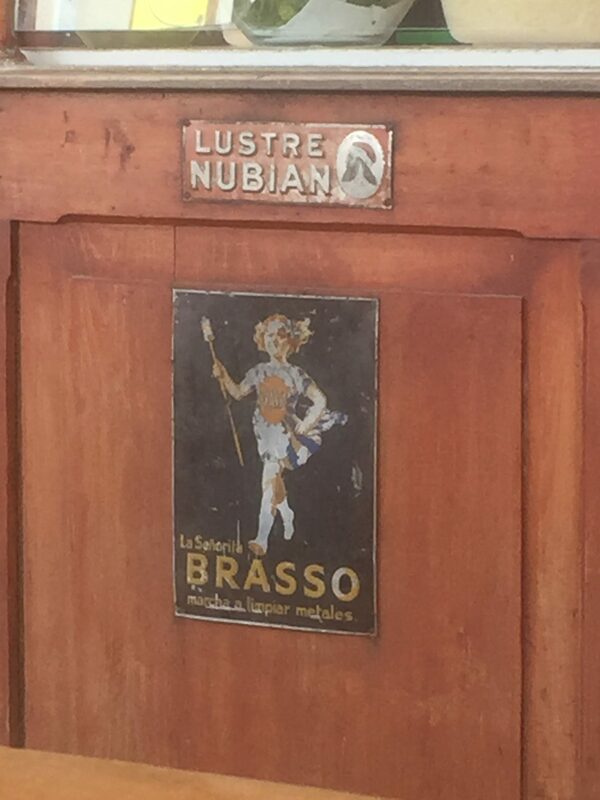 Nubian polish….. I’ll just leave that without comment. The pizza was interesting as it had all the different ingredients you would find anywhere in the world, but in different proportions. My ham, cheese, and onion included a few bits of ham, some cheese, and was piled high with thin sliced onions. All was washed down by a Cerveza Natale, another local brew—unfiltered, slightly sweet, hoppy but pretty much unrecognizable, and to be truthful difficult to drink a whole pint. It is an ale they describe as a “hybrid … a blend of Belgian aesthetics, British aromatic presence and pleasant bitter taste, emulating the Czech styles.” I guess they are trying to mimic the languages spoken around the mesita grande. Much of the day was cold and overcast, so a good one to run errands. 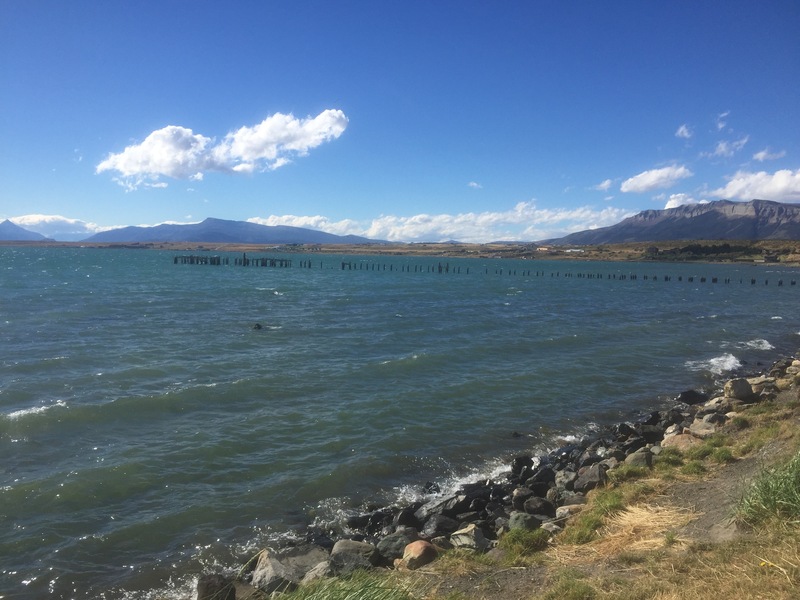 Late afternoon on a long walk by the gulf which, unlike in the US, is lined by gas stations, warehouses and the like, I discovered a cafe with big, old-fashioned mullioned windows looking out over the water sparkling in the late afternoon sun toward Torres Del Paine. A writer next to me had piles of papers and journals in front of him, scribbling madly, while the sound system played disco/electronica versions of sixties hits (including “California Dreaming” and “The Sounds of Silence”). Patagonia, definitely a place to visit. I was thinking today about the couple of pages Hemingway wrote on the craft of writing that were to be part of “Big Two-Hearted River.” As I recall, he wants to write the way Cezanne painted—daubs of paint invoking the scene (apples I think) rather than filling in all the details. Perhaps that is a commonplace and Hemingway’s influence has long since passed, but I was struck to learn that Bruce Chatwin carried In Our Time with him while wandering South America. Near the end of his book, he writes, “The walls of the dining-room were a hard blue. The floor was covered with blue plastic tiles, and the tablecloths floated above it like chunks of ice.” Ernest was looking over his shoulder as he wrote that. This morning I skipped the hotel’s free coffee [sic] for one last tall cappuccino at the Tapiz. Today the sidewalks and cafe swarmed with backpackers, most with clean bright equipment to match their smiles. The barista proudly presented my order in a tall clear glass perfectly layered—dark coffee, milky middle and foamy top. It reminded me of Jello 1-2-3 from my youth, but was much more satisfying. The bus station was even more crowded by mammoth backpacks dwarfing their carriers. 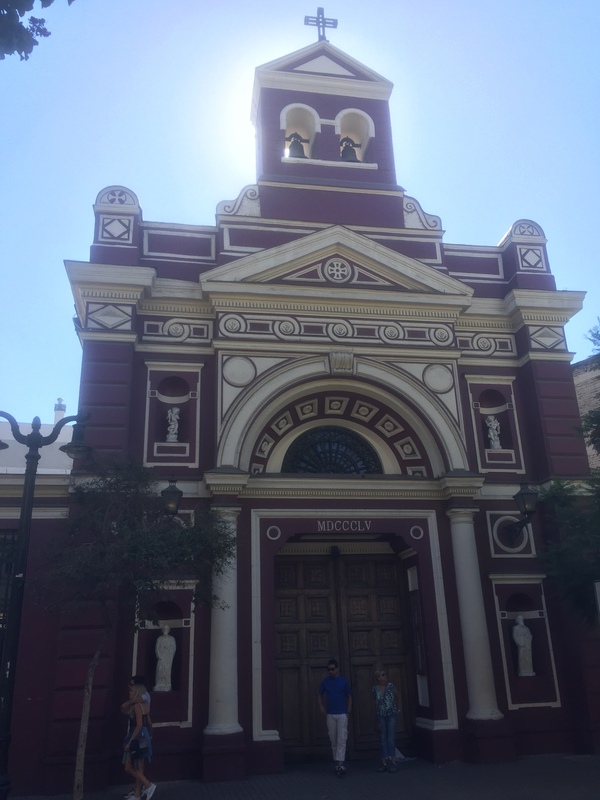 After some jostling and confusion, we made our way out of the city and past the airport. Now I finally got a sense of the sheer vastness of the Patagonian desert. Flat fields covered with brown grass and choked in places by gorse stretch to the distant horizon. Nothing interrupts the view except the occasional shabby estancia and, in the far north, the edges of the cordillera. The road runs close to the Argentinian border and it is definitely cattle country. The bus passed several towns or villages, it was hard to tell. Some seemed a main house surrounded by an expanding circle of smaller places. One was larger and looked to have some sort of stadium which I first thought was a soccer field, but a horse track is maybe more likely. A place for 21st century gauchos to show their skills. I never think of the word “gaucho” without being taken back to music classes at Woodstock Elementary School where Mrs. Danley taught us a song: “See the gaucho ride the pampas/ ride the pampas green and wide/ with his ? And ? 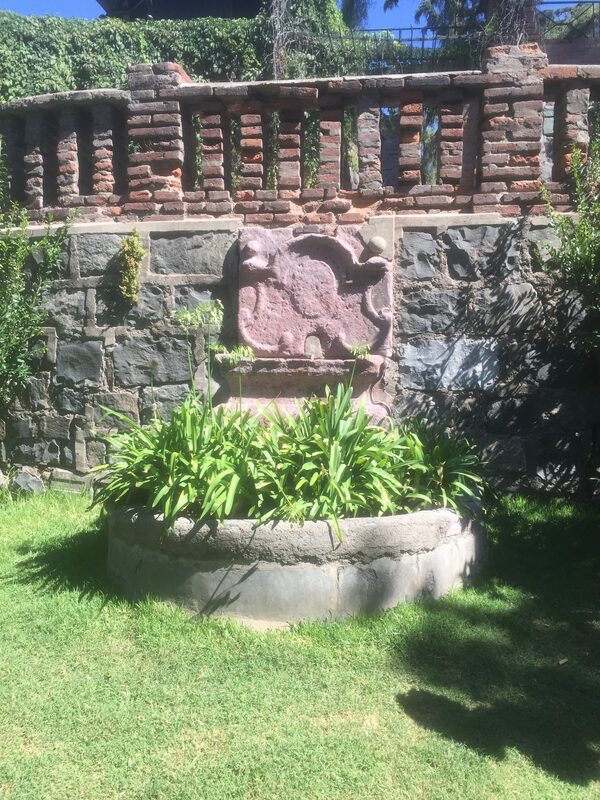 And a bolo by his side.” I have no idea the provenance of that song, but it was the first time I learned of South American cowboys, bolos, and the pampas. Like all sorts of other detritus, it sloshes about my head even today (along with my gratitude for Mrs. Danley’s infinite patience). 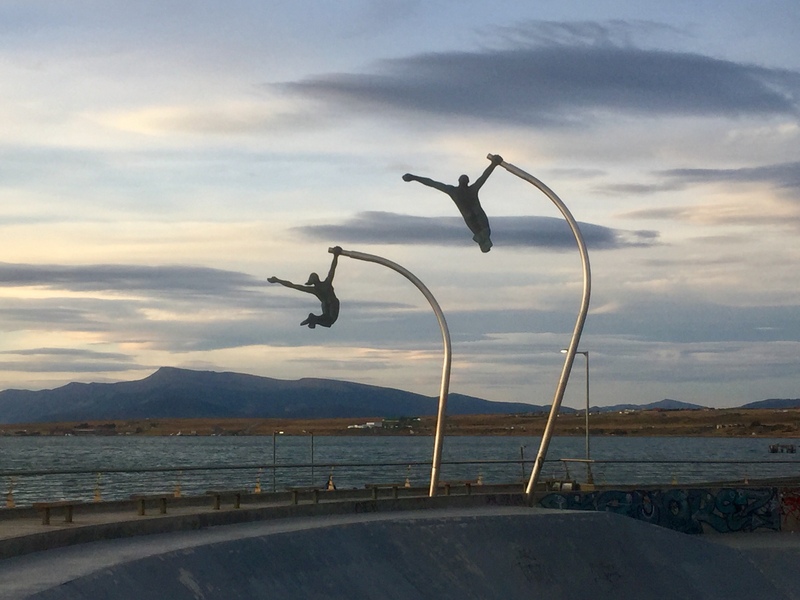 Puerto Natales has the feeling of a ski town without skiers. Full of outdoor stores, equipment rentals, some micro-breweries, and lots of people wandering around in trekking clothes. Most of the houses are one-story sitting on small lots, and the town spreads out widely over the flats edging right up to the curve of the lake. Across is the Torres del Paine park. 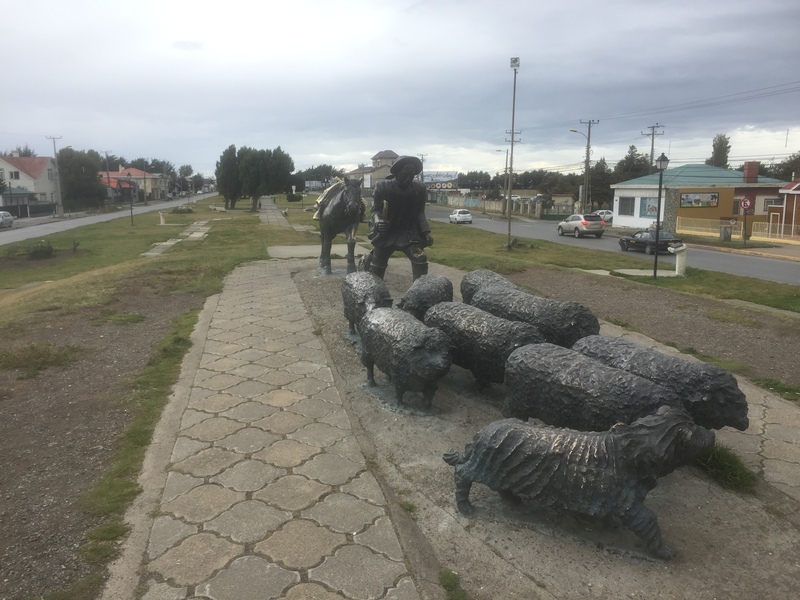 At one time this was a meatpacking town with a small train to move the product (I’m not sure if it was cattle or the butchered meat). 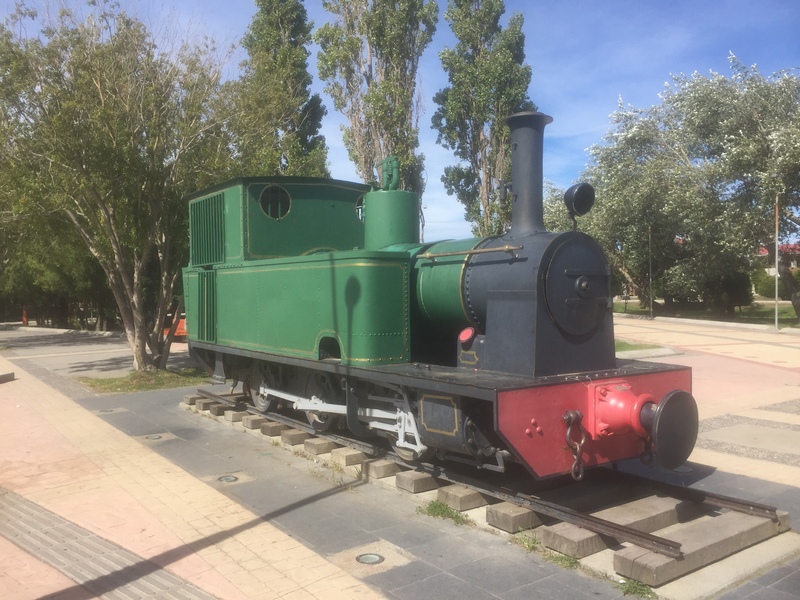 The narrow gauge engine sits in a place of honor in its own square looking very much like a missing friend of Thomas the Tank Engine. Across the street is a brewpub that makes surprisingly good ale and has bottles of some great USA brews. Beside it is a restaurant roasting full carcasses on leaning iron crosses over an open fire, so the meat tradition continues. Getting reservations to trek distance in the park is like trying to thru-hike the White Mountains on a limited budget, but more difficult. I’ve gone from trying to do the O circuit, to the W, and now maybe just the I (I made that last one up). Have a day or two to get organized, and there will be plenty of trekking further north later so no worries. To be honest, the park is probably as crowded as the White mountains, so not exactly the solitude required for good trekking. For now I’m enjoying a very clean and pleasant hostel—when everyone speaks, it sounds like the UN. The primary activity of parenting is making decisions—constant, sometimes difficult, often consequential decisions. Many pass gently, others have lasting impact. One site of unintentional cruelty is naming. Distinctive names can help form a child’s sense of individuality, but names that must be explained, while perhaps endearing, end up causing a lifetime of expliction. I’m not sure why my parents decided to call me by my middle name. My older brother’s first name was the same as my father’s and he did not want his son known as little Willie, so he was called by his middle name. Perhaps they just wanted to follow the same pattern. By and large I have no problem with the name “Hugh,” particularly in English speaking countries, but whenever I encounter documents—forms, credit card transactions, etc.—I have to explain that even though the printed name is Thomas, I go by my middle name. That also accounts for my stodgy academic name, “T. Hugh.” In Spanish speaking countries, going by Hugh brings a different set of problems: it is generally unpronounceable. So, for the next weeks, just call me Tomás. It was day of travel following a peaceful morning of coffee and short wandering about the neighborhood. The hotel arranged a car to take me to the airport, first winding through the middle of the city which, as the driver noted, is very colorful but dangerous for tourists, warning that your phone or camera will be snatched while you are using it. Passing through markets ringed by chain link and barbed wire with sidewalk stands selling bright colored cups of juice and fruit, we were soon on a highway lined by high-rise apartment buildings and corrugated steel shacks and workshops. I had time to look over the airport on this visit, confirming my sense that the main departure hall was one of those massive 1960s structures, this one with a curving roof reminiscent of Dulles in the States. In contrast, the domestic gates were in a new wing, replete with Starbucks, McDonald’s and Victoria’s Secret. 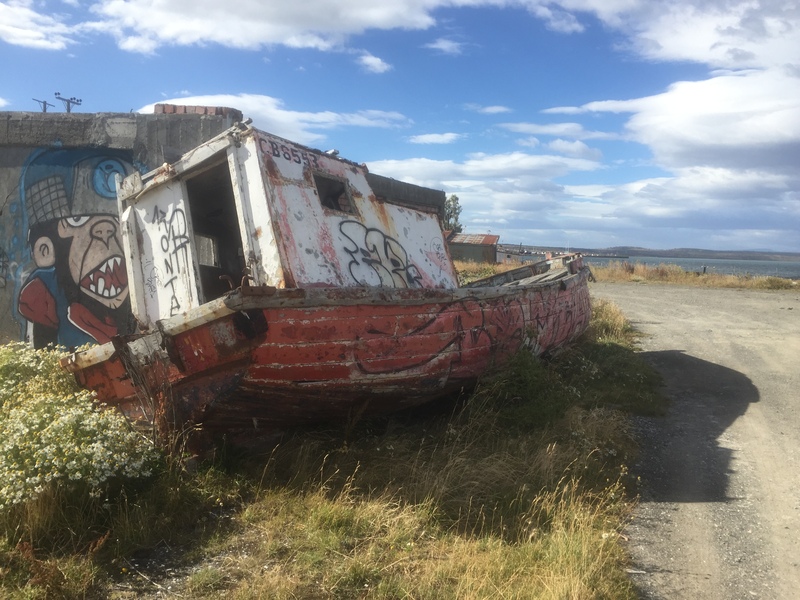 I walked in long circles while waiting to be called to board, reading the names of strange towns at the departure gates—I know little about this long country. The Latam flight was a cramped A321, a little hard on stiff knees but the view from the window when the clouds cleared was of steep desert mountains with increasing snow as we flew south, large lakes with no visible outlet, no signs of roads or habitation, a braided river much like those on the South Island of New Zealand, and, on the tops of peaks, round blue lakes which must be volcano craters. As we flew further south the lakes and rivers were headed by glaciers, streaked with mud when seen from above. I had google maps open on my iPad before leaving so it had stored the area and was able to match the view from the window with the precise shape of the many lakes and inlets below. We flew directly over Torres De Paine which I hope to be trekking in a few days. Nearer to Punta Arenas the land became brown and desolate with many dry lake beds that looked like the salt flats Darwin described in another part of South America. Landed in one of those airports that really does feel like the end of the world and made my way to the city past many warehouses (old and new) and small wood frame houses. As would be expected, there is a shipyard here. 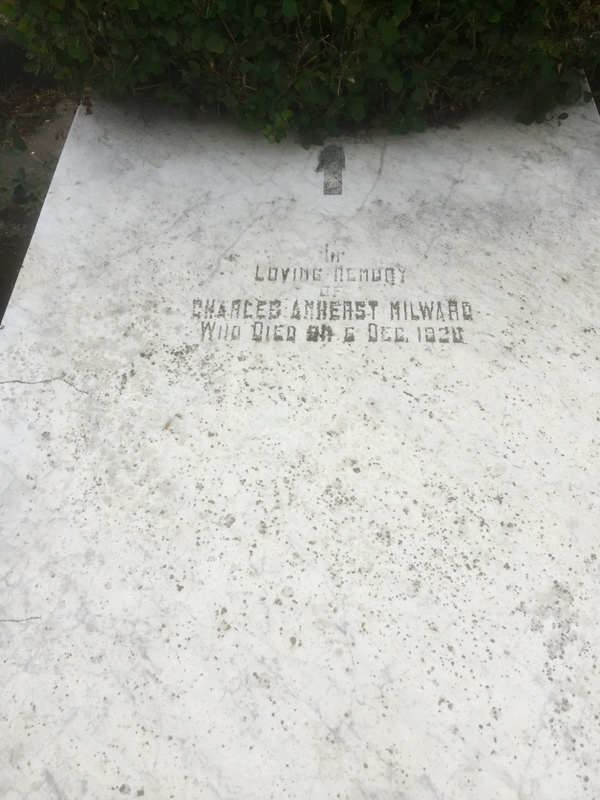 Bruce Chatwin’s relative Charlie Milward among his many occupations in Punta Arenas, ran a shipyard, though perhaps smaller than the rails here now. The downtown section reveals a city that has been here a long while—solid masonry structures, parks and wide streets with greenswards—but still reflects the sheer brutality that the weather must bring. 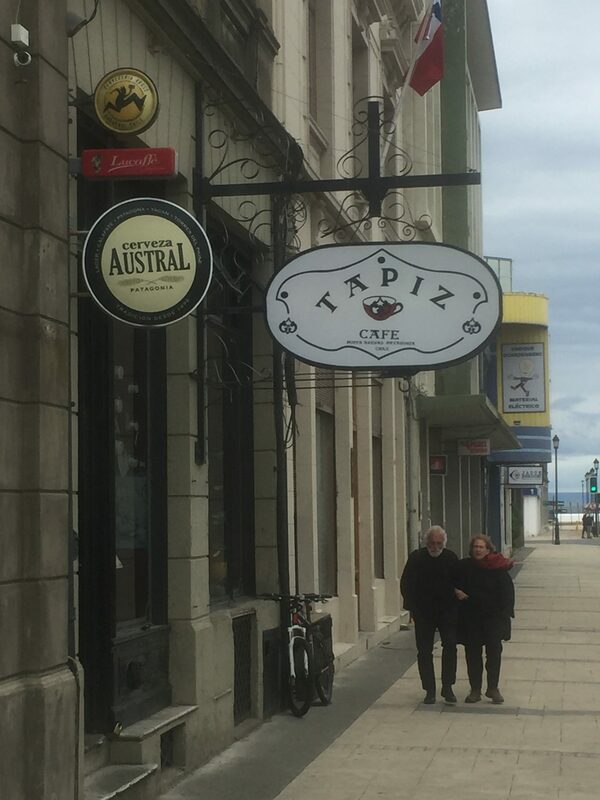 Dropped my bags at the Casa Haine (modest place) and went to O’Higgins street which is the center of restaurant district, enjoying crab cannelloni’s and discovering Austral (the Punta Arenas brewery) does make a (not very distinctive) pale ale. The Jekus is a warm wood-lined pub in an old building with arched brick windows and pleasant staff. As it filled up, the Spanish voices were drowned out by English, with the word “cheapest” most frequently uttered. 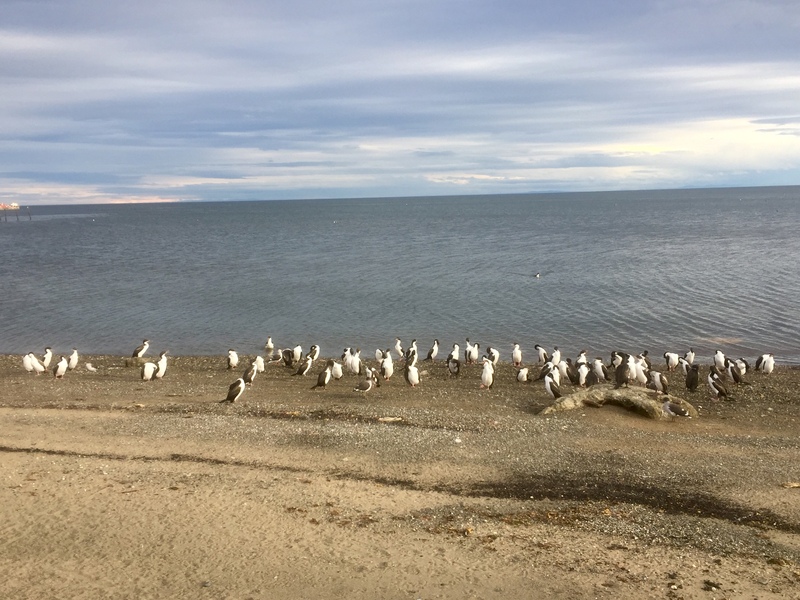 It is near the height of tourist season at this end of the world, so I’ll expect more of all that, but no despair as I could not contain my excitement about seeing the straits of Magellan. How many narrations of ships making their way through this place have I read? Felt like a kid. Restless night, still adjusting to time change, then over coffee I finished reading Darwin’s Voyage of the Beagle, and after, a quest for a battery power brick. Unbeknownst to me, the Wellington airport baggage team removed my Anker power brick—one that had taken me around the world—as new airline regulations do not allow them in checked bags. I use my phone with offline maps to check hiking coordinates and will be out in the bush for many days at a time, so a power backup is imperative. My understanding is that Latam Air (next airline I fly) allows them in carryon, so after more wandering and some absurdly humorous pantomiming in a camera store, I found a Chinese brick which I hope will do the trick. The Voyage of the Beagle was fascinating; I had forgotten how much of it is about geology, which would contribute to his gradualist sensibilities. His speculations about the buildup of coral atolls inspires some more travel one day, but his complacency about the British Empire’s improvement of the unimproved world was disconcerting to say the least. Coffee midday at But First, Coffee was pure pleasure. A narrow shop with a sliding window open to the sidewalk where customers queue for expresso or ice cream. The other half of the space, separated by glass windows, is a barber shop. The sound system plays jazz (with large video screen) and the baristas alternate with the barbers, working with their appointed customers— each with their own perfectly trimmed beards. Generally everyone dances as they move between spaces. Spent part of the the afternoon working out my itinerary for the next few days, then wandered aimlessly about Lastarria—an amazing neighborhood—before arriving again at the Utopia Cafe, just watching the world pass by while the customers at the neighboring table commented (in jest) on my pale gringo skin. Spent evening eating in the restaurant district, reading Lucas Bridges’s Uttermost Part of the Earth (a story of Tierra Del Fuego) and watching the crowd ebb and flow. 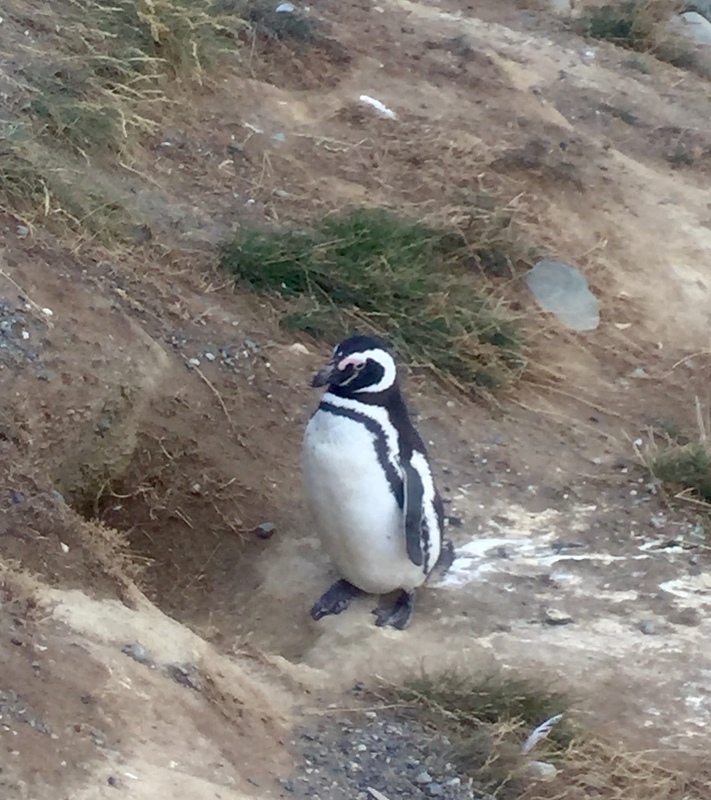 Tomorrow it is on to the southern reaches of Patagonia. 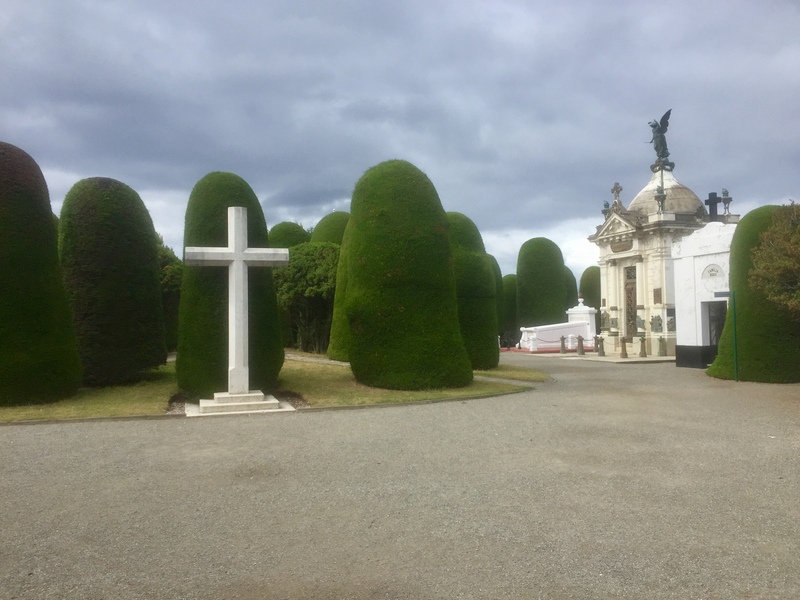 Left Wellington on the morning of the 18th, with a long layover in Aukland, then 10 hour flight that put me in Santiago early afternoon on the 18th. That dateline crossing thing is disconcerting, and my phone daily steps app parsed them oddly. Settled into a comfortable flat in the Lasterrria district— I decided to indulge myself before diving headlong into trekking culture. The area is very hip, many restaurants, small galleries etc. 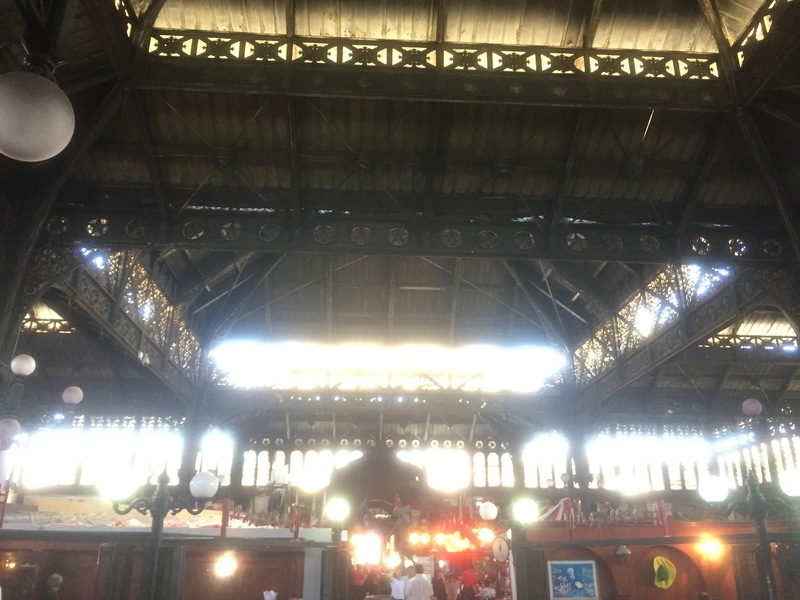 Took a walk out toward the river and then down to the Mercado Centrale, a large old-fashioned market with a soaring Victorian iron-framed roof housing fish stalls and their associated restaurants. Had fried fish, rice and a beer — simple but delicious. 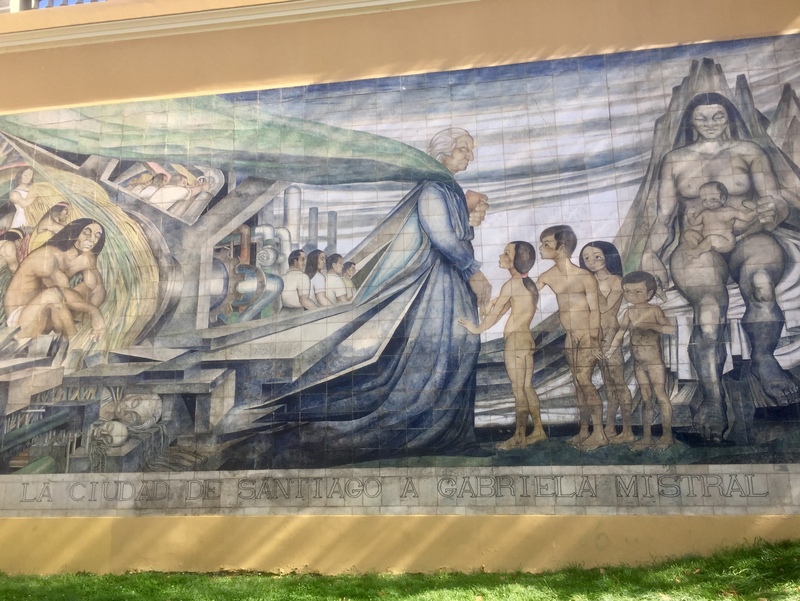 Wandered a while in the park of the Castillo Hidalgo and in the neighborhoods. As it was Sunday, people were filling the restaurants, and the street venders were out in full force, very festive with a lot of music. Was hot which may explain why the Chileanos love their helado. Lack of sleep got me, so I took a nap, waking to drift out into the evening to sample Patagonian beer at the Utopia cafe. Chile has not fallen into the IPA world just yet, so I’ll have to be content with lager. Austral which tastes great in the heat, but, like all lagers, is thin (apparently Patagonian beer is brewed by German immigrants which explains a lot). The server brought a great plate of bread with some spread to go with the beer— guess I looked famished or maybe pitiful. 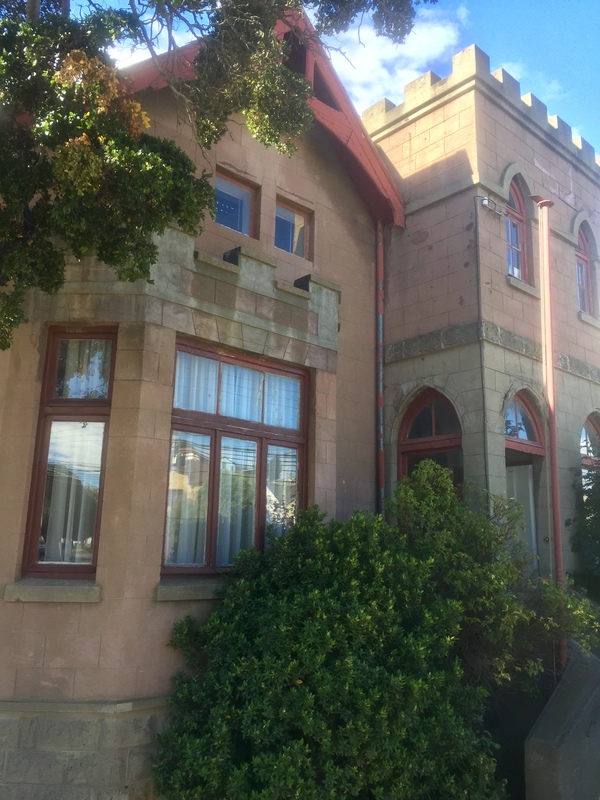 Just now beginning the transition from being a teacher in New Zealand to becoming, I hope once again, a careful observer— to learn again to slow impressions, focus on the minute and mundane, empty out triviality, and see place and people in their place, among them. A simple but difficult goal—that old Thoreauvian chestnut—simplify, engage, understand.